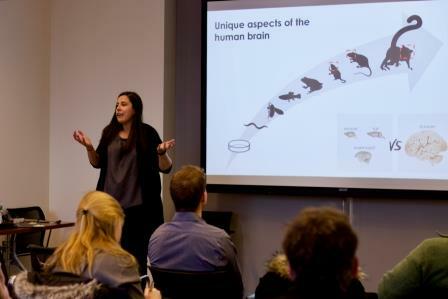 We had another amazing Conte sponsored Harvard Undergraduate Wintersession Program this year! It started on Tuesday January 22, with Personal Perspectives; emotional and courageous accounts from guests who experience firsthand what it is like to live with mental illness/trauma. Daniel Sullivan (NAMI) discusses his personal accounts and experiences. Jordan Smoller, PhD, Professor of Psychiatry, Massachusetts General Hospital Harvard Medical School and author of The Other Side of Normal, addressed the group in the afternoon and dove deeper into many chapters of his book and explained how the term normal has changed over the many years and its biological component. Wednesday had a different focus which was Basic Science Perceptives that included tours of both the Arlotta and Lichtman Labs as well as data blitz sessions in the afternoon from all four investigator labs. Richard Schalek, PhD, MS, Lichtman Lab explains what some of the equipment is so different from other labs and how they use it in their daily research. The afternoon sessions consisted of data blitz sessions from each of the Conte faculty labs to include more in depth information of what they are focused on and the amazing results that research can offer. Bruna da Silveira Paulsen, PhD, Arlotta Lab talks about Autism and organoids. Tobias Kaiser, MS, Feng Lab, MIT, spoke about developing new gene therapy for brain disorders. Daniel Berger, PhD, shows how the electron microscope and large image stacks help to better understand dendrites, axons, and millions of branches of other cells and how they connect. Day 3 – Field Trip! We headed off to McLean Hospital to lean about Clinical Perceptives and a tour of the Imaging Center and Brain Bank. Drs. Vahia, Silveri and McHugh shared experiences, both seeing patients and conducting research at McLean. Dr. Sabina Berretta, Harvard Brain Tissue Resource Center at McLean Hospital, handles the brains. Drs. Kate McHugh, Marisa Silveri, and Ipsit Vahia sit and take questions for a career panel discussion. The fourth and final day of Wintersession focused on Music Therapy, Art Therapy, and Career Panel. Aniruddh Patel, PhD, Professor of Psychology Tufts University, explained how music is having amazing and wonderful results on Autism, Alzheimer and Parkinson patients. He also discussed how music cognition has a special relationship between music and language (the topic of his 2008 book, Music, Language, and the Brain) and the processing of musical rhythm. 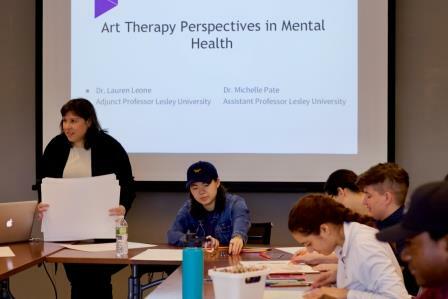 Lesley University and Lauren Leone, DAT, ATR-BC, LMCH, Adjunct Professor of Art Therapy Lesley University introduced the students to how art therapy can change behavior in many patients. The career panel provided students with a flavor of the nonclincial careers that exist within the field of mental health. Lauren Wilkins spoke about her experience with starting the nonprofit “Leadnow”, which is a group that aims to improve and promote mental health curriculum in high schools across Massachusetts. Kate Nemens talked about her 14+ years working on family law and domestic violence cases involving clients with mental health disorders. Patricio O’Donnell gave students a brief summary of his transition from academia to industry and fielded questions from students on working in both environments. David Mou, a psychiatrist and co-founder of the start up Valera Health, detailed the process of running a business that targets mental health disorders. A huge thank you to not only the Conte Center for the sponsorship of this amazing program but to our Wintersession team that pulled it all together to make these four days something for the students to think about for months to come.